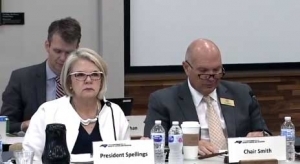 When Margaret Spellings stepped down as President of the UNC System late last month, she and the UNC Board of Governors were at pains to deny it was due to the politicization of the board and its desire to pull the university system to the political right. But even casual observers of the UNC system were well aware of Spellings’ continuing tensions with the board, which only intensified as a more conservative faction of the board took power this year. In a column in National Review this week George Leef, director of editorial content for the James G. Martin Center for Academic Renewal (formerly the John William Pope Center for Higher Education Policy — the NR article actually uses this obsolete identifier), leaves no doubt as to what conservatives thought of Spellings’ tenure at UNC. In brief: too bleeding heart to please conservatives. The long-time associate of George W. Bush who served as his Secretary of Education and, later, as president of the University of North Carolina system has decided to leave before her term was up. Spellings didn’t do much that pleased conservatives in the state. The Martin Center’s Shannon Watkins recently interviewed Spellings on her views on her tenure and thoughts about higher education. Spellings is proud of a couple of initiatives meant to close the gaps that leftists always complain about. These include programs that make college at a few outlying UNC institutions extremely low in cost. Not quite Bernie Sanders’ free college, but getting close. She points to a few successes, although good students who are really able to benefit from college probably would have found paths to success anyway. The trouble with these ultra-low cost programs is that most of the students who are lured in aren’t college material at all and are better off finding other kinds of training after high school. In case you missed the implication, those “few outlying UNC institutions” offering reduced tuition are those that attract minority and low income students. They include the historically black Elizabeth City State University and UNC-Pembroke, which began as and Native American educational institution and continues to have a large number of Native students. Ironically, it was the Republican dominated General Assembly that set aside $51 million to offset tuition dollars lost at the schools even as several Historically Black Universities and Colleges expressed their skepticism of the plan. Spellings and N.C. House Speaker Tim Moore both said they’d like to see the program expand, if it is successful.